Photographer Mike Korostelev spent some one-on-one time with a crocodile, resulting in remarkable underwater photos. But far from being scared, Mr Korostelev was delighted with his deadly encounter. He said: 'It was not an accidental meeting, the main purpose of my trip was to capture an American crocodile in its natural environment. 'I met this crocodile underwater face to face. When it swam close to me, the only thought I had was about how great it was that I could take great pictures. Owners who purchased a property overrun with copperheads used to kill one hundred of the snakes each year, but when they learned how important snake venom is to medical research, they had a change of heart. "We were supposed to come out on a Friday the first time," said Swanson. "We ended up being delayed by a day because he was burying his aunt, who had just died from breast cancer the day before. When he found out that we were out here to collect these snakes to try to use them for cancer research, it changed their whole outlook on it." It changed the Hubbards' outlook so much that they plan to turn part of their property into a conservation area so people can view the creatures in their natural habitat. They're hoping to open up the eco-tourist venture by sometime next summer. Herp Video of the Week: Caiman Lizard unboxing! 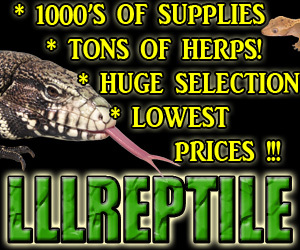 Check out this video "Caiman Lizard unboxing," submitted by kingsnake.com user Minuet. Submit your own reptile & amphibian videos at http://www.kingsnake.com/video/ and you could see them featured here or check out all the videos submitted by other users! In a feel-good story out of Texas, Fort Worth firefighters rescued a young girl's pet frog from a burning home. Firefighters happily reunited the daughter with the family’s pet frog, who appeared unharmed, Jones said. How did taxidermists preserve the likeness of a now extinct species? Very carefully and with painstaking research. Lonsesome George was the last of the Pinta Island giant tortoises on the Galapagos. Due to human intervention in the ecosystem his entire species whittled down to just George. Since his discovery he'd been well cared for and revered by scientists across the board. Several attempts at mating George just never panned out and he died from old age. Within 24 hours of his death he was frozen with the decision to taxidermy him. The first step of the process was to get George to the museum for evaluation. This involved huge amounts of coordination and paperwork to get him to NY through customs and into the States safely intact. They worked against the clock to minimize any types of freezer burn or damage done to George that could happen when kept frozen too long or transported poorly. After the museum assessed George, he was brought to the Wildlife Preservations taxidermy studio in Woodland Park, NJ. George Dante, president of Wildlife Preservations and an expert in the field of taxidermy, lead the effort in bringing George's likeness back into existence. Since there were no other animals of his species to base him off of, extensive amounts of research went into making sure the process was as accurate as possible.